On March 30, 2015, Mike was driving south in heavy traffic that was being directed by cops on Worlds Fair Drive near Napoleon Court in Somerset, New Jersey. To avoid getting stuck in traffic, Mike decided to make a U-turn to drive a less congested way. As he turned left, there was a vehicle also traveling south that was improperly passing Mike (crossed over double yellow lines) on the left and collided into Mike in the northbound lane. The entire front of the other driver’s car was smashed into Mike’s front tire (driver’s side). Mike was transported by ambulance to Saint Peter’s University Hospital where he was evaluated, treated, and released home with pain medication. As a result of the incident, Mike suffered injuries to his right shoulder and lower back. He attended physical therapy for approximately 7 months and underwent several injections to help relieve the pain in his right shoulder. However, the pain did not go away. At that time, Mike worked as a barber and had difficulty in this line of work due to ongoing shoulder pain. When minimally invasive and conservative procedures failed to improve his condition, Mike underwent surgery (right shoulder arthroscopy) two years after his accident. Mike had told his client about his car accident while cutting his hair one day. It was thanks to this customer that he learned about The Case Handler! With the help of our team at Pollack, Pollack, Isaac & DeCicco, LLP, Mike was able to focus on getting better while we handled everything else. 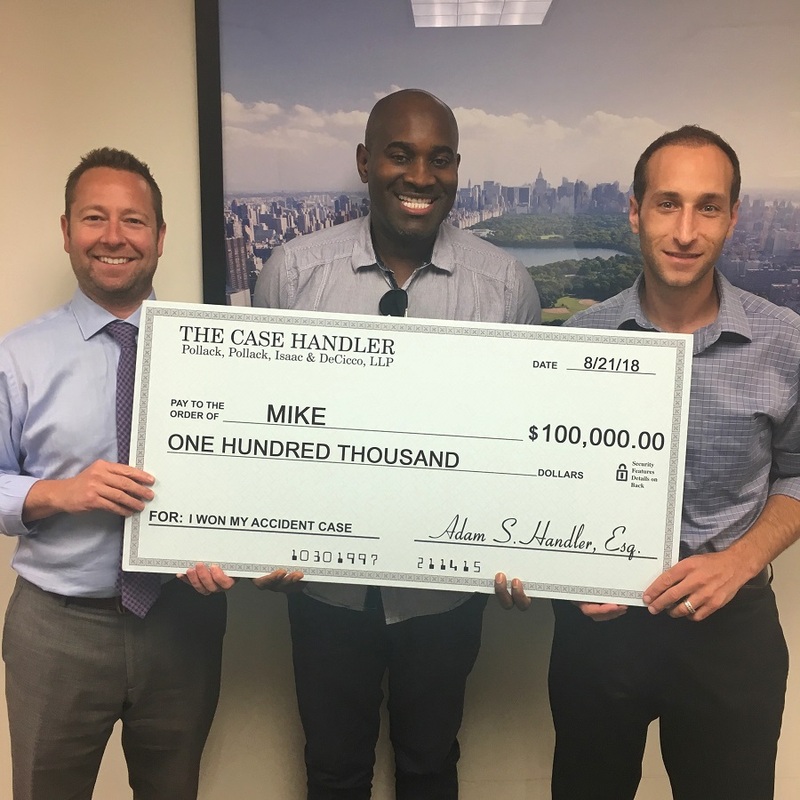 Our team successfully helped Mike obtain the maximum policy limits of $100,000.00 to settle his bodily injury claim! In a matter of seconds, Mike’s world was flipped upside down due to the actions of a reckless driver. Fortunately, Mike’s condition has improved since surgery but there are still days that he feels pain to this very day. While settlement day is an exciting time that marks the close of a client’s personal injury claim…it does not necessarily mean everything is back to normal. Injuries can last a lifetime, which is why our team fights hard to help our clients recover life-changing compensation for their life-changing injuries. If you were wrongfully injured by a reckless driver, speak to a reputable New Jersey auto accident lawyer that you believe will fight tooth and nail to recover “the full amount for” you.